Methanol Analysis Cartridge | OndaVia, Inc. 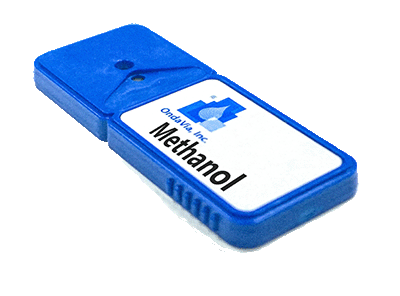 The OndaVia Methanol Analysis Cartridge is designed to measure methanol in aqueous solutions. Methanol, or methyl alcohol, is the simplest alcohol. If consumed, methanol is converted to formaldehyde and then formate, leading to illness. For this reason, it is added to ethanol to make denatured alcohol. Methanol is a frequently-used solvent and feedstock. It is also used to reduce hydrate formation in deep-water oil wells, with subsequent negative impacts at the refinery waste water treatment plant. To address the needs of the oil & gas sector, we have developed a method for the measurement of methanol in crude oil. Compared to ASTM D7059-04 (Standard Test Method for Determination of Methanol in Crude Oils by Multidimensional Gas Chromatography), our method is simpler, faster, and cheaper. It also has far superior detection limits with the potential to measure ppb-level methanol.